A worsening of the security situation in Jammu and Kashmir (J-K), the signing of a $8.9-billion (Rs 60,520 crore) deal for French Rafale fighter jets, and new deals for artillery were among the top five determinants of India’s uncertain security situation in 2016. India made many high-profile defence purchases in 2016 and carried out a much-publicised “surgical strike” against Pakistan-based terrorists, but an IndiaSpend examination of defence data revealed gaping security holes. India became the world’s fourth-largest defence spender in 2016 with a military budget of $50.7 billion (Rs 3.4 lakh crore)–nine times the health budget for the same year–an increase of 8% over 2015 ($46.6 billion or Rs 3.2 lakh crore), according to the 2016 Jane’s Defence Budgets Report, released by the UK-based research firm IHS Markit. India’s 2016 military budget was around a quarter of China’s $191 billion or Rs 13 lakh crore. The Indian Army conducted “surgical strikes”–as the government called them–against terrorists within Pakistan-occupied Kashmir (PoK) on September 30, 2016. Since then, at least 33 Indian security-personnel have been killed in J&K, according to data collated by IndiaSpend from various news sources. 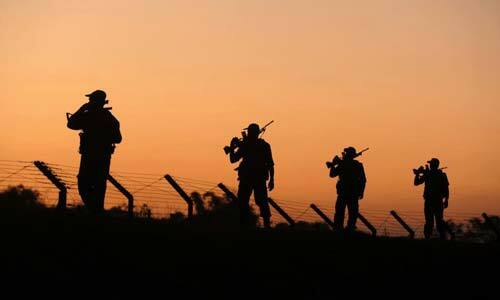 As many as 71 Indian security forces personnel were killed this year by terrorists in J&K, as of November 27, 2016, up 82% since 2015, when 39 soldiers were killed, according to data tabled by the home ministry in the Lok Sabha (lower house of Parliament). Injuries among security personnel doubled since last year to 208. Incidents of terrorist violence in J&K increased 47% to 305 in 2016, from 208 in 2015. The data indicate that terrorist activities increased over 2016 in J&K compared to 2015, IndiaSpend reported on November 25, 2016. India signed a $8.9 billion (Rs 60,520 crore) deal with France to purchase 36 Rafale fighter planes, forming two squadrons of the Indian Air Force (IAF). The IAF is down to 32 fighter squadrons, the lowest in a decade, NDTV reported on February 26, 2016. It should have 42 squadrons or around 670 to 750 aircraft. The IAF also inducted two indigenously developed Tejas Light Combat Aircraft (LCA) and hopes to add on six squadrons (120 aircraft) of the Tejas by 2022. The government is reportedly looking to buy up to an additional 200 single-engined fighter aircraft (10 to 11 squadrons) of foreign origin to be produced in India. The 200 foreign fighter aircraft to be built in India are unlikely to be ready by then, since new factories will have to be built after a deal–not an immediate prospect–is signed. The defence ministry approved the production of 114 dhanush (bow) howitzers in June 2016, the first artillery system purchased by India since the Swedish Bofors gun in the 1980s. India also signed a deal to purchase 145 ultra-light M777 howitzers from the US for $737 million (Rs 5,000 crore). The Indian Army requires 3,000-3,200 howitzers of various calibres, as envisaged first under a 17-year-old plan. India successfully tested the 5,000-km range Agni V (Fire) on December 26, 2016, bringing it one step closer towards being formally deployed by the strategic forces command. The nuclear-capable Agni V is an intercontinental ballistic missile, capable of reaching all parts of Pakistan and China, IndiaSpend reported in May, 2015. However, on December 21, 2016, a test of the 1,000-km ranged subsonic nuclear-capable Nirbhay (fearless) land-attack cruise missile failed. Out of four Nirbhay tests, three failed. India’s entry into the Missile Technology Control Regime–an international agreement which will allow New Delhi to trade in high technology–in June helped pave way for India and Russia to extend the range of the jointly developed supersonic Brahmos missile beyond 300 km. The much delayed INS Kalvari, the first of the six French Scorpene-class submarines being manufactured in India, is undergoing sea trials and might be commissioned early in 2017. But India now has 14 operational submarines, according to Indian Navy data, and requires 20 more, as IndiaSpend reported in July 20, 2015. The Scorpene project suffered a setback after nearly 22,000 classified pages explaining the submarines’ combat and performance capabilities were leaked by an Australian newspaper in August. The Navy said the leak was not critical. India reportedly attained a nuclear triad–the capability to launch nuclear weapons from land, air and sea–by quietly commissioning the nuclear-powered ballistic missile submarine INS Arihant in October. The Indian Navy commissioned INS Chennai, the third and last of the Kolkata class destroyers. India also signed a deal with Russia to purchase four guided-missile stealth frigates.